I’ve watched “Blood,” the season three finale of Man Seeking Woman, three times now. The first viewing was in preparation of my interview with creator Simon Rich and Katie Findlay, the co-lead who first stole our hearts as Lucy way back in “Futon.” I rewatched it because a) I had to review it, and I was worried there was something I’d missed and b) honestly, I just wasn’t ready to say goodbye to the show. This, despite the fact that—and you’ll know this if you check out the interview, which you should do anyway because it includes a reference to puppets and pumas—Rich & Co. are totally ready and willing to keep the show going. Because as we’ve discussed here in the comments, a wedding isn’t necessarily the end. It is an end, but it’s also a new beginning—for Josh and Lucy, as well as for the show. And after seeing how well the reset worked and the chemistry among the cast, I’m optimistic about what lies ahead. it can’t be worse than Gragdor, anyway. A wedding’s a pretty standard way to wrap up a season, and “Blood” plays it surprisingly straightforward. Even the string of increasingly inconvenient incidents, which include a delay on the open bar, and a last-minute switcheroo of place settings, feels familiar. TV nuptials go wrong almost as often as they go right, with cold feet frequently slowing the walk up the aisle. Or sometimes families just get in the way, because someone objects to someone else. Sure enough, Josh and Lucy’s wedding hits several snags thanks to their parents, who have formed a secret society to foil their plans for a “cool” wedding (if there is such a thing). There will be no day drinking or mismatched plates, not if the Parkers and Tom and Patti have anything to say about it. I was slightly thrown by the reveal, because after seeing them conspire together, I thought for a brief second that the parents might have felt that this all happened too quickly. 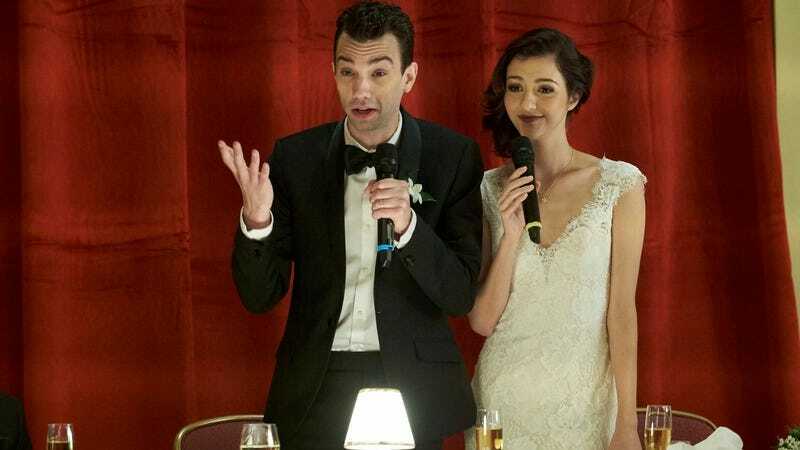 It’s not the case, of course—Man Seeking Woman has far more up its sleeve. This confrontation of old and new, traditional and unconventional, parent and child has been in the works all along. Jay Baruchel and Britt Lower hinted at it at the start of the season, that even though their characters are adults, there’s still a certain amount of rebelling against your parents involved. We’ve seen that play out in various ways over the course of season three, whether it was Josh establishing boundaries in “Ranch,” or career-minded Liz trying to get Patti to show more excitement over her promotion in “Dolphin.” Or how about Lucy choosing a career in the arts instead of whatever it was her parents might have wanted her to do? And Rich also said that’s one of the season’s major themes. So Josh and Lucy thwart their parents’ plans and regain control of their wedding. Because they do it together, their folks finally realize they’re ready to go out on their own. This agreement is only reached after Lucy and Josh throw all traditions out the window, refusing to even name God in their proceedings. Which is too bad since he makes a personal appearance. That’s Richard Kind playing the insecure deity, who has no idea what in His name is going on at this wedding. There’s dancing down the aisle, Liz as the officiant and, in the most telling moves, Josh ripping off the bowtie that Tom had personally fastened to his neck while Lucy kicks off her mom’s shoes, which were her something borrowed. When the time finally comes for a reading from the Bible, God balks at the choice of reader: a gay man. God storms off, literally—there’s rain to demonstrate his tears, and thunder to symbolize his anger at being forsaken in His own home. (It’s interesting that he had no qualms about the inter-religious couple, though.) Not even all the talk of love—which, in some circles, is God and vice versa, no?—is enough to mollify him. It’s bitingly funny to see God behaving so, well, human. And Kind is in high form here, so flustered and profane as he tries to get his rental car to work. Still, that’s really all the drama we have in store for us, as well as the most outlandish bit. Once at the reception, the parents sulk, but after a heartfelt thank-you from the bride and groom, they realize their work here is done. And just in time, too—the monster Gragdor crashes the reception. I won’t deny getting misty-eyed when Josh and Lucy immediately turn to their parents for help, only to hear that they’re on their own. Not entirely, of course—they’ve got each other. Now armed with a sword, a shield, and a flamethrower, Josh and Lucy tackle their first challenge as a married couple. Aaaand scene. This episode was a fitting end to the season as well as the show. Even though there’s certainly a lot of comedy to be mined from the first year of marriage, “Blood’s” mere implication of further adventures is emotionally and narratively satisfying. If this is the end, then what a delightful way to go out. But this probably isn’t the end, which I’m okay with, too. It’ll be interesting to see how they branch out, but if any show can do it, it’s Man Seeking Woman. I’ve watched this show grow right alongside Josh, and I’ve enjoyed the progression. To think that the same show that gave us “Pitbull” could also yield the sharp critique of “nice guys” in “Cactus” is surprising and gratifying. There are few shows that offer such, for lack of a better word, economical storytelling. The writers only have 10 opportunities per season, but there’s been so much character development and experimentation in the last two seasons, you’d think the show’s on the old 22 schedule. So I guess I’ll see you all at the bris (come on, you know that’s where this is heading). “Blood” was written by Dan Mirk (who wrote “Futon,” hey!) and directed by Michael Dowse. Kudos, lads. Having planned a wedding myself, I got a kick out of watching Josh and Lucy sort the people in their lives by order of importance and/or similarity. Josh and Lucy’s wedding reception had tables for uncles, teachers, West Coast Relatives, and newly awakened coma patients. I realized I don’t know Tom’s last name. Patti is still a Greenberg, though. Speaking of which, Joel was a no-show, but who knows if he was even invited? Josh never spoke of him. Maybe that’ll come up next season? I’m really going to miss this show. Even if it continues, I will miss what it was. This isn’t a presumption of the quality of any future ventures, but of all the “lonely guy” shows out there, this was the best one. I’m kidding, I don’t call them that. Thanks for reading and commenting, y’all! See you again next year. Maybe.